Home | Crafts | Halloween Boo-nanas! A quick and easy way to balance the sugar overload of Halloween while making fruit fun! 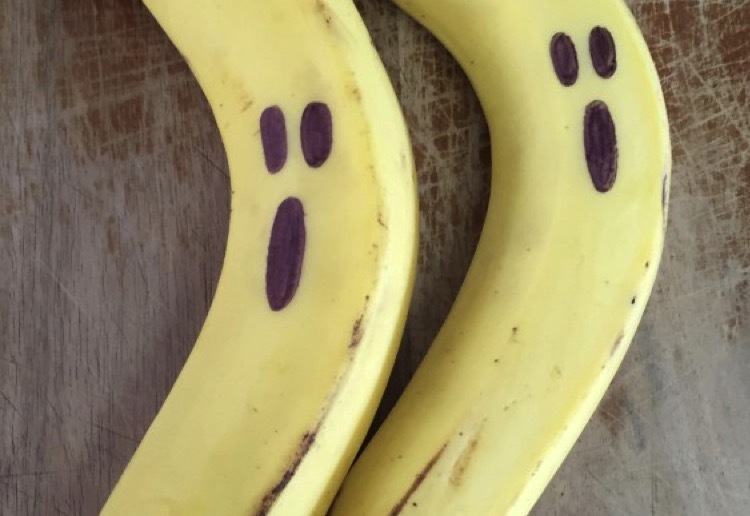 Draw a face on the boo-nanas. Sit back and feel great adding some fruit to the Halloween loot your child may get! Notes... Your kids not on board with fruit at Halloween? Get them to draw the faces or help colour them in. Keep offering them in the lead up to Halloween and they may surprise you on the night. Oh that is so easy. The mums on here are so creative! Another cute …oopps frightening treat. lol Well done. Spooky bananas both trick and treat. Ha ha can’t wait to try this one in the lunch box. Thanks for the fun idea. My daughter has already asked for them to start week 1 of term 4 tomorrow. These bananas would make you look twice. Would be a good trick any time of year! They look like little spooky ghosts! The boo-nanas look great! Thanks. Perfect for lunch boxes – most of the other kids wanted them too!